I participated in an Influencer Activation on behalf of Influence Central for Mudderella. I received complimentary admission to facilitate my review as well as a promotional item to thank me for my participation. Back in March I was introduced to an athletic event that, while I knew it would be extremely challenging and strenuous, I was also excited to attend. After all, how often do we have the opportunity to push ourselves to our limit (and beyond) physically while receiving the support, encouragement and company of our closest friends? It was time to lace up my (old) shoes and hit the road for Mudderella! 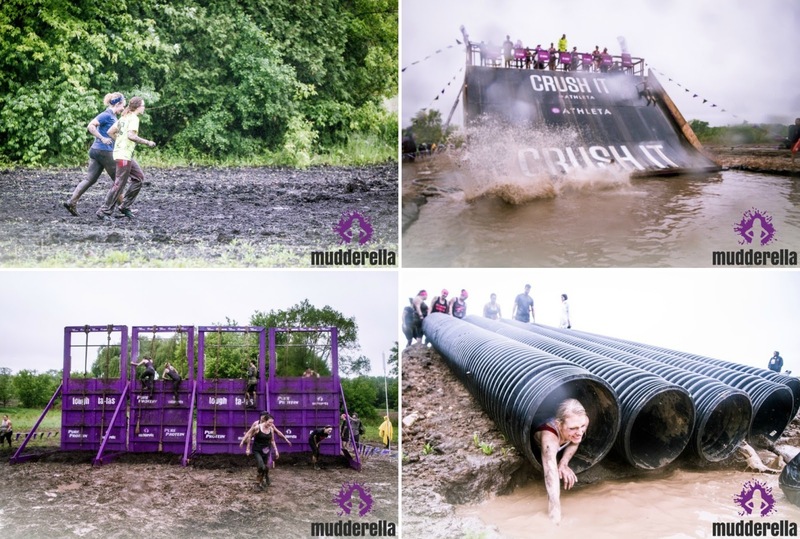 As I previously mentioned, Mudderella is the first and only full-day athletic event series designed for women, by women, to challenge all-round strength, balance, endurance and agility in a team environment. It isn't a race or a competition, it's a way to "Own Your Strong" and prove to yourself that you can tackle the course and the obstacles. At the same time, whether you take part with a partner or in a huge group, the experience of togetherness and being strong while having fun and enjoying the day is pretty much indescribable. The laughter and camaraderie and eagerness to lend a hand between friends as well as with complete strangers really does make this event stand on its own. Yes, it's called Mudderella and yes, I knew that the course would involve mud. But thanks to Mother Nature deciding that we needed rain here in Midwest specifically on the day of this event, the amount of mud that was absolutely everywhere was immeasurable. From the moment we began walking up to the check-in table, the mud squished up over our shoes, right through our socks and in between our toes. When it came to actually attempting to run, I found that I had a difficult time just keeping my feet underneath me, let alone then being able to move quickly as it raised higher than my shoes. At the same time, how often as adults do we get to play in mud? It was squishy, oozing, a little gritty, very slimy, obviously dirty and more... but hey! It was also fun! The very first obstacle that we encountered was titled Down To The Wire, requiring participants to crawl through mud under a set of wires and wooden planks set close to the ground. I love this photograph that was captured of me, because I think my face perfectly captures my combination of complete disgust mixed with hilarious disbelief! The power of friendship and laughter. Life is busy and we all know that it can be difficult to juggle everything and still work in time to get fit. Add in that getting in shape is typically a solitary event and it's no wonder that a lot of women crave something that is more social. As Mudderella makes fitness a full-day athletic event in which you are surrounded by thousands of other like-minded women, it instantly makes you feel like you're part of a community. Even though there were plenty of moments during the hours that we were trudging through mile after mile of mud that I felt as if I couldn't go on, the encouragement from my amazing friends made it possible. We helped each other over 10-foot walls, across a waist-deep river, up and down rocky terrain or simply up out of the mud when we slipped and fell and I couldn't have been happier to have them there alongside me. 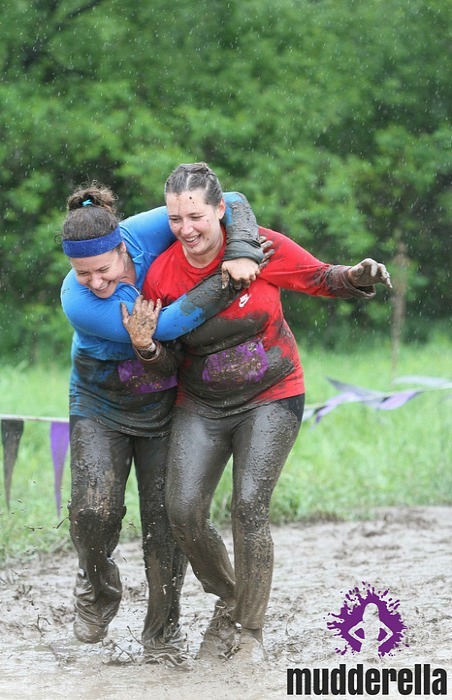 One of my amazing friends putting up with me almost pulling her down into the mud while pretending to do a piggyback ride during the I Got Your Back obstacle. How cold we would be. I've lived in the Midwest all of my life, so I know cold. But even though I had been checking the forecast for well over a week before Mudderella Chicago and I had dressed warmly (compared to my original plans), the temperatures progressively dropped during the time we were on the course and ended somewhere in the 40's before we finished. That Mudderella would be more prepared for the number of people and the weather. 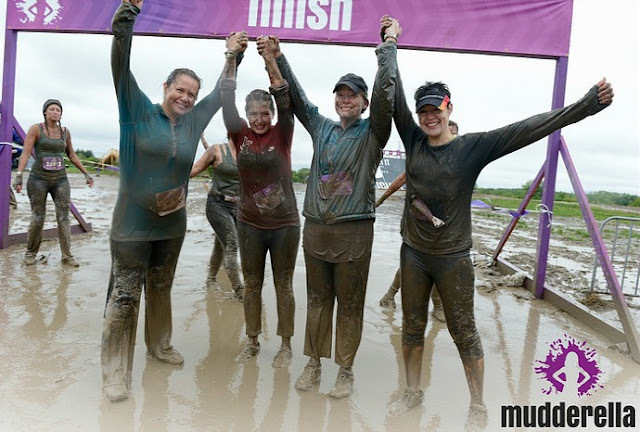 Mudderella organizers cannot control the weather and planned this event assuming that participants would enjoy themselves and the experience from start to finish. Unfortunately, it seemed that even they underestimated just how cold it would be by the late afternoon and the state that participants might be in by the time they completed the course. It seemed that the majority of staff, photographers and volunteers had disappeared; there weren't enough warming blankets (the silver crinkly sheets that you see marathon runners draping over themselves at the end of their races so that their muscles don't go into shock); the "warm showers" that had been promised were dripping hoses; the bag check area (which cost extra) was unstaffed and completely unorganized; and, worst of all, the line to get on a shuttle bus back to the parking lot was dreadfully long and directly out in the freezing wind. 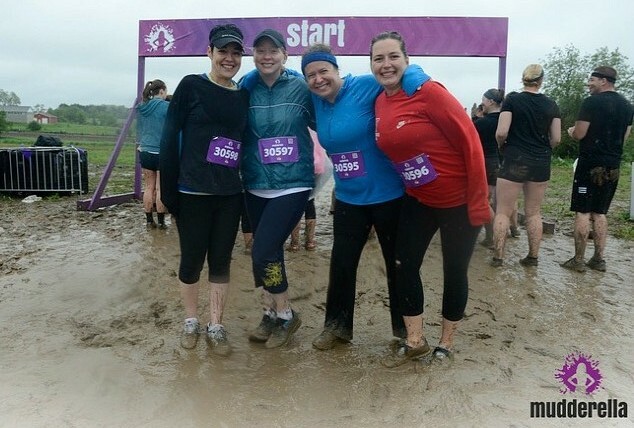 Again, I do not blame Mudderella for the weather. But I do blame them for the number of participants that needed medical attention when there weren't medics to be found and for not doing far better planning to help combat the cold temperatures. 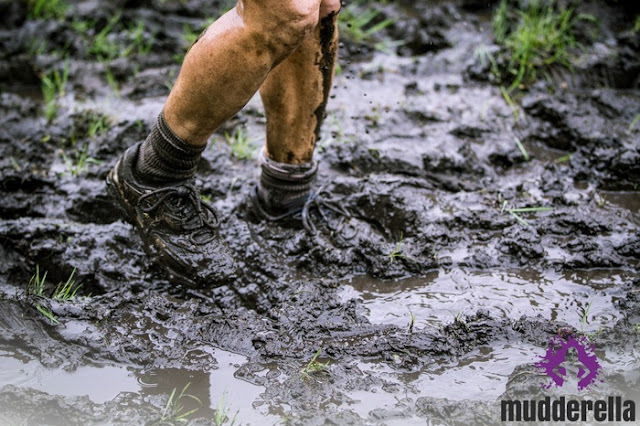 Mudderella is for everyone, no matter your fitness level. Considering the length and difficulty of the event (and my feelings of intimidation by the Mudderella Training Program! ), I have to admit that I had assumed that I would be surrounded by top athletes who would be able to do far more than someone like me. However, I absolutely loved that throughout the day there were women (and a small percentage of men) in ALL shapes and sizes and levels of fitness. I conversed with women that were very physically fit as well as those that were just starting their journey to better health and wanted to do so in a way that was much more fun and social and involving human connections than simply getting on a treadmill. In the end, I have to agree that Mudderella is more than an event; it's an attitude, way of life and way of thinking that is far more positive, encouraging and fun than a solitary workout. Assuming you live somewhere where it won't get down to 45° at the end of May, I would highly recommend this incredible experience for anyone and everyone, no matter how in shape or out of shape you might be. The feeling of accomplishment at the end makes it all worth it! Ready to Own Your Strong? Head over to Mudderella.com to find out more and sign up for your local course and be sure to connect with this incredible event on Facebook, Twitter, Pinterest, Instagram and through the #Mudderella2015 hashtag. 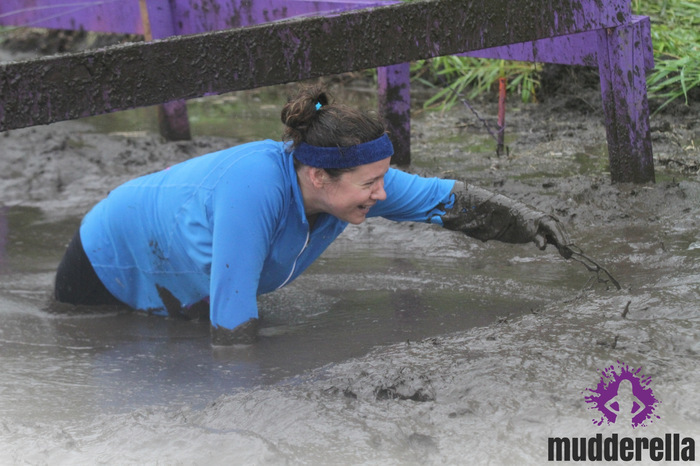 wow, I never heard of mudderella. I wonder how they got all that mud?!!! It looks like fun, but I wouldn't do it when it was that cold, but I give you a lot of credit. It is a fun way to be a little crazy for a couple of hours! lots of laughs!! !